This may look "girly," but don't be fooled. It's about 13-14% alc. vol. What a weird quote from a good actor. Maybe all the intelligent lines come from another’s pen…. Many celebrities are like that. Have you ever seen a reporter ask a model about fashion? It's painful. But that’s neither here nor there. 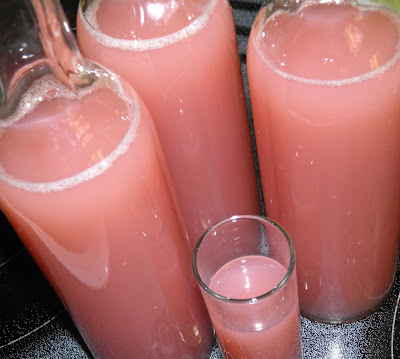 The reason for my post is that It’’s been a while since I’ve bottled up some booze, and even longer since I’ve attempted a “cream” liqueur. I believe I have cracked that last particular nut. Or at least it appears to have been cracked by my end result. That bodes well for a whole series of liqueurs I have in mind. This particular blend of ingredients ws an accident – because I was in a rush at the liquor store and not paying attention. I knew I was going in to buy "not vodka" and in my haste grabbed a bottle of gin. I wanted to make a homemade version of “Baja Rosa®.” I was supposed to be buying tequila, not gin. Thank goodness gin makes just as good a liqueur. It’s just not tequila. To rectify my stupidity I now have a batch of “tequila rosa” steeping. But back to the “cream” business. I have made actual liqueurs with cream, or cream to be added before drinking. I have made infusions with part-whey part water, but I have never used whey in this volume before. What would happen? I was reading a few days ago about Portuguese milk liqueur. It sounds really good (and easy). Essentially you put milk, vodka, sugar and lemon in a jar and let it sit a few days. 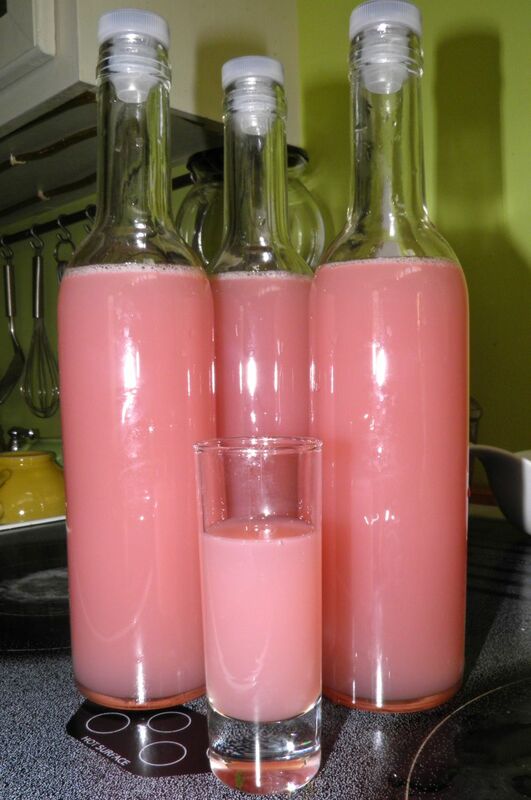 The curds separate out from the milk, and after you filter several times, you get a clear liqueur. The “creaminess” comes from the mouth-feel of the whey as opposed to what we think of here as a creamy drink. I have to admit using a lot of whey is the “way” to go. I would imagine that the whey adds some shelf stability to the finished liqueur as well. But don’t quote me on that. It's pure speculation. Stem and slice the strawberries. Place them in a saucepan with the water and sugar. Bring the mixture to a boil, reduce the heat to medium and let it cook for 5 minutes. 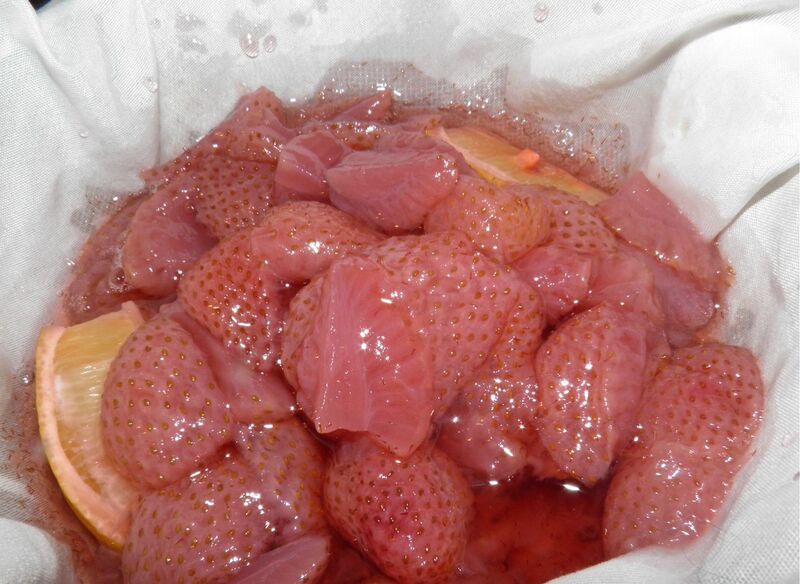 Remove the cooked strawberries from the heat and let cool. 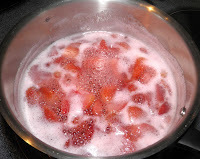 Then pour the fruit and liquid into a large jar with a well fitting lid. Pour in the gin, and drop in half a whole lemon. Make sure both jar and lemon are well washed beforehand. The liquor, whey and bonus cheese. Seal the jar. 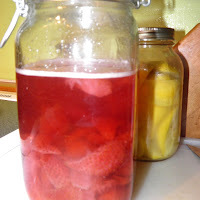 Let the infusion sit on your counter, out of direct sunlight, for three days. After three days, strain out the solids. Heat the milk nearly to a boil in a saucepan. Stir in the lemon juice and remove from the heat. Let the milk curdle and cool. 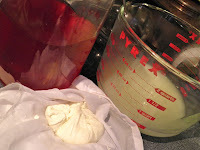 Strain out the curds through a piece of clean fine cotton. Add the whey to the infused liquor, mix well, and bottle. The yield is three 375 ml bottles plus a not so small “reward” for the cook. There’s another benefit to making this much whey as well. Knead a little salt and herbs into the curds that are leftover and use it as a spread while you enjoy your liqueur!